Bandai Namco has finally confirmed that the hugely popular My Hero Academia is coming to the Shonen Jump crossover fighting game Jump Force. Series protagonist Izuku Midoriya, also known as Deku, is the latest fighter to join what is quickly becoming an expansive roster. Ever since the announcement of Jump Force, one of the biggest questions was whether we would see My Hero Academia represented. Over the last couple of years, My Hero Academia has become of full-on sensation, quickly becoming one of the most popular anime and manga series of all time. Some may think an announcement like this would be something Bandai Namco would want to announce early, but either way, My Hero Academia fans can rest easy. 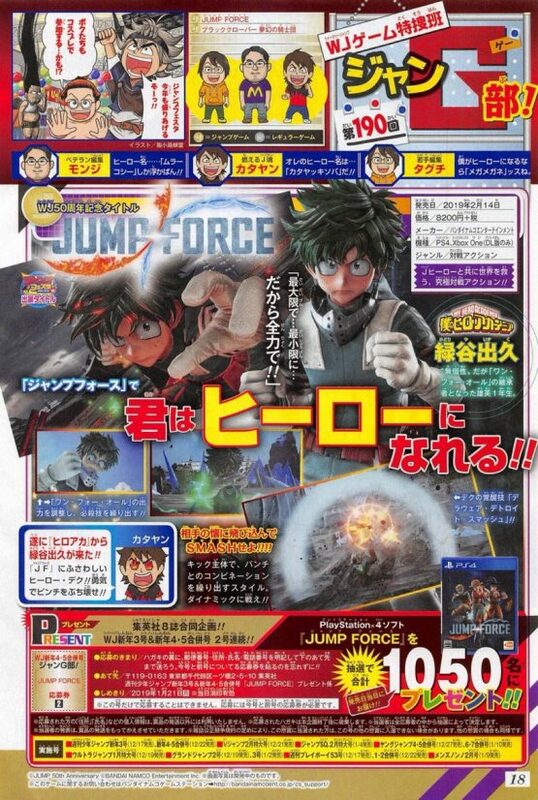 Like many recent Jump Force announcements, Deku was announced within the most recent issue of Weekly Jump, which means there are no official screens or footage at this time. It will be interesting to see how his “One For All” Quirk will be utilized in-game, but that’s likely something we’ll see once he gets officially revealed. The news hasn’t stopped for Jump Force in the past week. In case you missed it, three more characters joined the Jump Force roster from One Piece, Dragon Ball, and Bleach, all of which are already represented in-game. Another popular manga series, Black Clover, just got its first playable character announced recently. In addition, a stage based off of One Piece was shown in action. Jump Force will be released on February 15, 2019 for the PlayStation 4, Xbox One, and PC. Are you ready to play as Deku in it? What other characters and series are you hoping is represented? Let us know!